I initially published this in the Salt Lake Tribune in August 2010. ED physicians in Utah got very upset about this, thinking that I was attacking them, and wrote very nasty things in the paper that attached me personally. I was actually attacking health care administrators, across the country generally and in Utah specifically, but they didn’t seem to notice. If anyone has watched a Detroit Tigers baseball game in recent years, you’ve seen these advertisements on the fences, so it’s obviously a practice around the country. I don’t think the offense by the ED physicians was warranted, but I do feel that any offense by administrators should be felt. This practice is a joke, and I don’t think this piece, though 5 years old, is any less correct today. While many in the country decry the President and Congresses recent attempts to decrease health costs as inadequate, emergency departments (EDs) across the Salt Lake Valley have increased their attempts to further raise revenue for themselves. Local EDs have increased their marketing efforts recently with billboards, websites, and even phone texts stating their current ED wait times (“Hospital ERs hook patients with shorter waits,” 21 Jul 2010). While these efforts of educating consumers so as to better compete with each other are consistent with a smart business model, it is not consistent with the stated goal of many in this country of decreasing health costs. The obvious reason for doing this is for area hospitals to compete with one another for a finite number of patients with emergencies. But the likely unintended consequence (or intended consequence, depending upon your level of skepticism) of such advertising will be to increase the total number of patients utilizing emergency care, thereby treating more people for non-emergent conditions, and thus increasing revenue for the hospital. Despite stated claims to the contrary by these hospitals, reason suggests that such advertising will increase the number of inappropriate ED visits. The nation already has a problem with increased volume of inappropriate visits, and advertising wait times encourages many with non-emergent complaints to seek care in that setting. Those with true emergencies (heart attacks, trauma, difficulty breathing, etc) will be seen more immediately in an ED than those with less emergent conditions anyway, so the very purpose for an ED’s existence completely negates the need to advertise such wait times, except to draw in patients with non-emergent conditions. Some may not see the downside to this. The truth is that EDs provide much more expensive care, in large part secondary to overtreatment, than do other health care settings (“Overtreatment in ER remains a concern”, 3 Aug 2010). It also increases the likelihood of hospital admissions, as the ED is the gateway to the hospital, even if many of these patients are there unnecessarily. This then leads to further unjustified revenue for the hospital. Not only does this lead to increased health costs for everyone in the country, but it also puts these patients at increased risk for medication errors, serious infections, blood clots, and other potential mishaps that unfortunately occur in hospital settings. Another reason for skepticism is how the waiting times are calculated, leading to the question of whether the hospitals are actually competing on meaningful grounds. Some of these waiting times are reportedly calculated as an average over the previous 4 hours, meaning they are often misleading to patients. Also, many patients are admitted to the hospital overnight to cut down the advertised time instead of remaining in the ED for a few hours of observation before a likely discharge, as has been practiced in the past. Again, not only does this increase costs, but it may actually end up being harmful to the patient. There are many ways to manipulate these advertised numbers. So while in many ways traditional competitive business models may have some positives to offer in decreasing health costs, in this particular setting it will actually do the opposite. And as many studies and much data have showed over the years, an increase in health costs for one leads to an increase in health costs for all. Just over a century ago in 1918, 30 year old Hippo Vaughn won the pitching triple-crown, leading the National League in earned run average (ERA), strikeouts, and wins. Despite it being considered the “dead ball era” due to severe low scoring environments, his ERA+ was 159, meaning that he was 59% better than league average as he led the Chicago Cubs to the World Series that year. One year before this tremendous season he made history by throwing a double no-hitter with Fred Toney of the Cincinnati Reds. Both men retired all 27 batters through 9 innings, before Vaughn’s Cubs lost in the 10th inning. All of this together has led some to claim that he was the best left-handed pitcher in the National League, and maybe all of baseball, during the years of World War I. Despite this amazing career, one thing sticks out to me more than any other: his name. He received this nickname midway through his playing career due to immense size and lumbering walk. In many ways it was an unfortunate nickname, and it is not known whether he found it offensive. Like it or not, it has obviously become part of his legacy. Many fewer remember Fred Toney than Hippo, because Fred isn’t quite as exciting a moniker. Baseball history has provided many wonderful and well-known nicknames: Bumpus Jones, Lefty Grove, Dodo Bird, Cool Papa Bell, Catfish Hunter, Three-Finger Brown, Preacher Roe, and of course, Babe Ruth, to name just a few. There are numerous baseball nicknames, both then and now, that poke a little fun at the player (Yogi Berra, Wee Willie Keeler), describe some of his skills (Hammerin’ Hank Aaron, Brooks “the Vacuum Cleaner” Robinson), reference his ethnicity or nationality (the Hebrew Hammer, the Mexecutioner), make a play on his name (A-Rod), or even the occasional innuendo (the Big Unit, bar far my favorite baseball nickname of all time). The main thing that is missing in today’s nicknames, however, is the cognomen that becomes completely linked as a part of an individual’s moniker (such as the above mentioned Babe, Preacher, or Yogi). What’s happened to these nicknames? While many current players have been given silly sobriquets, the majority of them are more akin to the simple, cultural shorthand names along the lines of A-Rod. The mind simply cannot create any less of a fallow appellation. Even the better nicknames, such as Country Breakfast (Billy Butler) or Kung Fu Panda (Pablo Sandoval), while much more creative and fun, still lack the identity-defining title. If George Ruth requested a reservation, few would notice. Even the baseball-centric nickname Sultan of Swat would draw more confused looks than excitement. 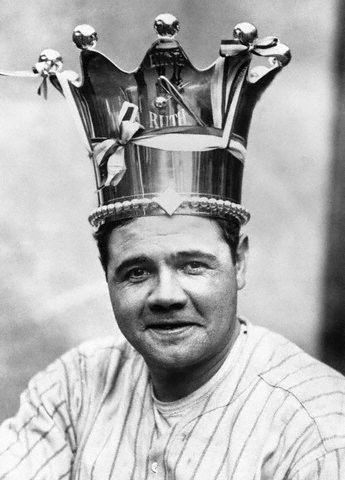 If the name Babe Ruth were given, mountains would move to get him at your restaurant or hotel. So why do we not have these anymore? I wish I had an inimitable answer, though the likely rejoinder is as with so many others nowadays: it’s the internet, stupid. A century ago, the world of newspaper barons holding a metropolitan monopoly on the daily rag allowed for few places for a player’s name to be experienced. Most of these distinguishing designations originated from either newspaper beat writers or teammates, though either of these origins would find its way into the public consciousness through a printed daily. It then became a ubiquitous identifier for the player, now known to all who may have an interest. The internet has now created so many sources of information on a player that few of the dozens (hundreds?) of nicknames given will stick. There are many great ones being created, but few catch on. Is this a worthy price to pay for internet accessibility? Absolutely. It’s just a shame that there may not be another Hippo coming along anytime soon. Healthy Utah: Medicaid Expansion or GOP Shell Game? Healthy Utah is Gov Gary Herbert’s (Republican) idea of a unique “Utah solution” to Medicaid expansion. While I support the plan in general (mainly using Medicaid funds to subsidize purchase of private insurance), the idea that this is a “uniquely Utah” (read: anything different than what the dark overlord Obama wants us to do) way to do it is hogwash, as multiple other states have tried very similar iterations. Gov Herbert is walking the fine line of utilizing federal dollars to follow the public polls supporting coverage of everyone (yes, even in Utah) while trying to make it seem that he does not support, and will not participate in, the great evil that is Obamacare. Straight Medicaid expansion was never a serious consideration in Utah, so Healthy Utah was negotiated with the Centers for Medicaid and Medicare Services (CMS) for Utah to get as far away from traditional Medicaid as the feds will allow. Healthy Utah now is a legitimate option for Utah, passing the Senate Health and Human Services Committee yesterday 4-1. It now goes to the Senate where there should be enough votes to get it through easily, though the House represents the biggest challenge to the law. As in all politics, the joke comes when certain politicians oppose something for ideological reasons and yet try to pass a bogus argument off as the real reason for their disapproval. Senator Christensen, a dyed in the wool, Obama-hating, gun toting tea partier (along with many other conservative legislators) claim to be against Healthy Utah for fiscal purposes, even though it is simply because they hate Obama and the federal government and don’t want to be associated with this administration in any way. The plan will cost Utah $237 million over 6 years, bringing in $3.2 billion dollars in federal funds, expanding the state economy by $650 million per year over that time, and decreasing social services spending in other programs by $60 million. This all to cover well over 100,000 citizens who currently do not have health care. Sen Christensen’s legislative response to Healthy Utah (SB 164), nicknamed Frail Utah, is the “medically frail” Utah bill (SB 153). While covering only 10% of the most “medically frail” (which is a very nebulous definition to be sure) Utahns, this bill would cost $200 million over 6 years, bringing back just over $600 million in federal funds. The tea partying Utah House members claim that this represents a significant savings as compared to Healthy Utah, and that it won’t hamstring the state’s budget as much. “I’ve got $100 million worth of requests sitting in my committee and there are not any of them that will get funded if we take it all for Healthy Utah,” said Christensen, (R) Ogden. I don’t see how the medically frail option saves any more money, considering the dramatically increased amount of federal money coming to Utah and the savings to other programs, not to mention the overall economic increase that will bring in more tax revenue. I call a big fat BS. Just call a spade a spade—the GOP hates Obamacare. We can all respect honesty, as opposed to this hiding behind false arguments. Much of the fiscal conversation also revolves what will happen after 6 years, as the federal match gradually decreases; how on earth will we pay for it then?!? Why do so few people realize that step 1 to decreasing medical costs is providing coverage? It could seem a little backwards to cover people in order to decrease costs, but the ability to get care when and where it’s needed is one of the biggest problems in our system today. I’m sure there are diminishing returns with the number of uninsured being covered and decreasing costs, but I can accurately guess that we are nowhere near that threshold where the decrease in costs may not justify the investment (strictly from a fiscal point of view). We will be much better off and easier to handle our elevated costs years from now if everyone has health coverage. I initially testified before the Utah Legislative Health Reform Task Force in support of the Healthy Utah plan in September. My testimony is what evoked poor Rep Michael Kennedy’s (Republican) now infamous comment. The task force voted against any sort of federal dollars back to Utah for coverage expansion. I spent all of yesterday morning at the Utah State Capitol testifying in support of Healthy Utah. 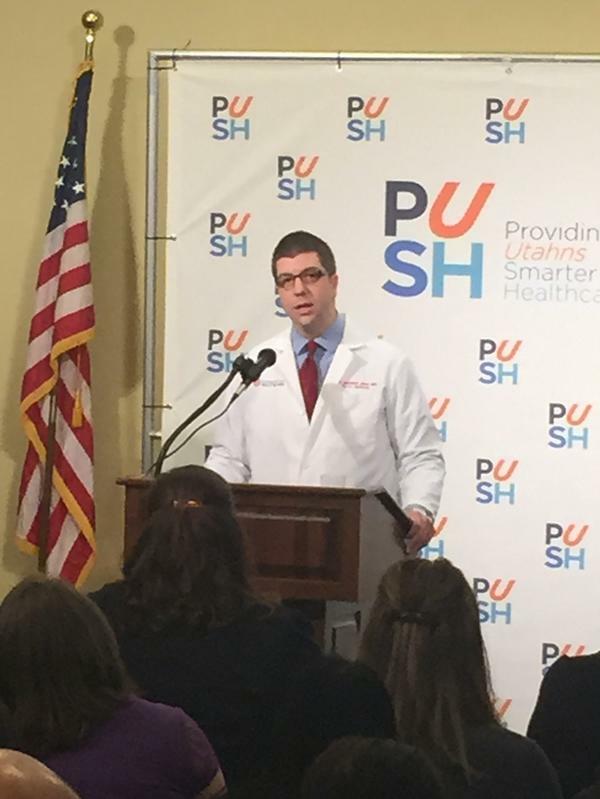 I testified first to the Social Services Appropriations Committee, and then at a press conference for the new PUSH Coalition, which includes a number local and national patient advocacy groups. 3 years ago even the most optimistic Utahn would not have guessed we would be as far as we are today. I don’t think any health coverage plan is ideal, but I fully support Healthy Utah as something that will cover all remaining Utahns with a reasonable plan.